After two months we have new version! There are no big changes in the code, only two new features and a few bugs fixed. We also have the cqrlog icon back! DEB packages for Ubuntu Trusty, Xenial, Yakkety and Zesty are ready on Launchpad. If you are using my personal PPA, new version will be part of system updates. More information in Download section. 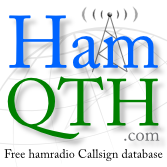 CQRLOG uses data from HamQSL website provided by Paul, N0NBH. A few months ago I published short article how to configure Conky to show the propagation images. It worked but I still had some issues with it. I decided to write a special application to show the data on my desktop - CQRPROP.